Our company, DASOLA, which also operates the Genuine Salt Cave, is able to create similar salt caves in any place that a customer desires. Our company, DASOLA, which also operates the Genuine Salt Cave, is able to construct similar salt caves in any place that a customer desires. Our company, DASOLA, which also operates the Genuine Salt Cave, is able to erect similar salt caves in any place that a customer desires. In the last 10 years, salt caves have been gaining greater recognition throughout the world. They have been built and beneficially used in many countries including Poland, Pakistan, Israel, the Czech Republic, Slovakia, Hungary, Finland, Austria, Germany, the UK and the USA. 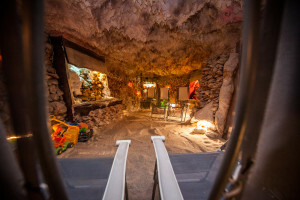 The salt caves that are built today, imitating the old salt mines, are coming closer to where people live. Salt caves built with active sea components are the newest, most original method of application of salt from the Dead Sea, Black Sea, Pakistan, Ukraine and Poland in prophylaxis, treatment and recreation. Our company, DASOLA, which also operates the Genuine Salt Cave, is able to build similar salt caves in any place that a customer desires. Our salt caves allow us to bring the healing power of salt and the ocean to places where customer can come any time of the year in all weather. We are able to change any client’s desired location into an attractive and comfortable place, similar to an original cave rich in therapeutic and esthetic characteristics, a place of comfort and attraction for visitors. Our salt caves can be built in hotels, spas, fitness or wellness centers, therapeutic resorts, Olympic training centers, or in the privacy of your own home for the therapy of your own family and close friends. Area of salt caves built by our company is usually from 30 to 60 square meters but we can virtually build salt cave of any size. To build salt caves, we use natural and only hazard free materials. All the walls are well covered with rough salt stones; the floor is covered with a layer of granular crystal salt. Depending on the specific size of the cave, it can consist of 15 – 40 tons of salt. By using such tremendous amounts of salt from different parts of the world (Pakistan, Poland, Ukraine or Dead Sea) a unique microclimate is achieved, rich in ions and minerals and micro-elementary particles like sodium, potassium, calcium, magnesium and many others which are loosened into the air. They are naturally absorbed into the human body during the therapy by breathing this saturated air into ones lungs and thus improve income and supply of these irreplaceable elements, necessary for good health, performance and overall fitness of the population of all ages. All the walls and the ceiling are made from cement stucco mixed with salt. Cascading waterfalls with water mixed with salt from the Dead Sea are made of stones. Impression of being in an old salt mine is created by using old timbers for a decoration. So that the salt cave can really be helpful in treatment, during its design, we properly estimate all devices which are needed for operation. The most precious thing in the cave is its unique microclimate. To protect it, air circulation is established by using the latest air cleaning technology today. Specific air filters that are designed to clean pollen and the smallest dust particles in the air are used. Other devices are used to kill all viruses and harmful bacteria in the air, to preserve appropriate temperature, humidity, high concentration of negative ions, and proper concentration of salt and other minerals. Sterilization of the cave inside is achieved by using ultra-violet lamps, which are turned on after each treatment. Ultra violet light kills all viruses and harmful bacteria that might occur in the air and therefore increases protection of the next clients to come. In addition to therapeutic values our caves offer also esthetic values. To cover the walls we use rough salt stones in all kinds of pink, orange, red, white and black shades. Color is result of admixture of minerals according to a location from which salt was mined. Atmosphere of a real cave is achieved by stalactites on the ceiling. During the procedure visitors can comfortable relax on adjustable chairs. The natural therapeutic values of the salt are enriched by color-therapy, relaxing music and soft murmur or waterfalls. Because of the unique healing power, our salt caves have become more and more popular and are especially attractive for people who live in big cities and towns, as well as inhabitants of plateaus and mountains. People all over the world are seeking salt caves for treatment, for rehabilitation and for relaxation in attractive and healthy environment. Candles made of 100% pure palm wax are natural products with no chemical additives. Purest Colloids produce the true colloidal products which provide the highest level of effectiveness.